"Jim's legacy lives on through his family and all the dedicated employees who continue to provide his standard of Excellence in Transportation." Lake State Railway Company was created by the vision of the late Jim George in 1992 when he acquired the railroad lines previously operated by Detroit & Mackinac Railway Company (D&M). 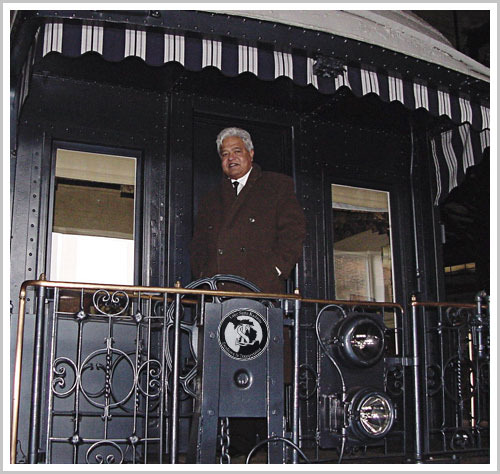 His passion for expanding the railroad and providing exceptional freight transportation services is what brought these lines from being nearly abandoned, to being a successful railroad. In 2005, LSRC acquired rail property from CSX in the Saginaw, Michigan area. These lines were operated under the name Saginaw Bay Southern Railway (SBS) until January 2012, when LSRC merged these two companies together under the name Lake State Railway Company. In April 2012, SBS interchanges and railroad accounting practices were converted to LSRC, completing the consolidation. Consistent investment in rail infrastructure, equipment and facilities has positioned LSRC to continue to expand its' business. To drive this continuous improvement, LSRC has developed a rolling five-year track maintenance and improvement plan. Grain, fertilizer, coal, chemicals, aggregates, cement, steel, and scrap metal are just a few of the commodities that are transported along the lines. LSRC continues to be a consistently profitable railroad and shows a high priority to maintaining and improving its' rail infrastructure. LSRC strives to maintain a proactive position towards safe operations.